Many people have questions about anesthesia for their pet and various aspects of their pet's surgery, and we hope the following information will help. It also explains the decisions you will need to make before your pet's upcoming anesthetic procedure. We understand that the idea of an anesthetic procedure for your pet can be a scary one. Therefore, let us reassure you that we take every possible step to ensure the safest and most comfortable anesthetic experience for your pet. Prior to any anesthetic procedure, we perform blood tests appropriate to your pet's age and current health. This blood work provides information about your pet's internal organ function and hydration status, as well as any infection or anemia that might be present. This blood work is critical to ensuring a safe anesthetic. These tests both alert us ahead of time to any possible anesthetic complications and give us baseline values for the future. Once we have the results from these tests, we tailor each anesthetic plan to the individual pet. We adjust the amount and type of anesthetic to be used based upon the health and age of the patient. On the day of the procedure, we do a thorough physical exam before administering pre-anesthetic medications that both help to relax him and to ensure a smooth anesthetic experience. We then provide constant monitoring before, during and after the procedure. Every procedure is monitored by a dedicated anesthetist who, in addition to monitoring vital signs, also uses specialized equipment to monitor blood pressure, heart rate, respiration rate and carbon dioxide levels. For the majority of our anesthetic procedures, we also place an IV catheter. This not only allows us to administer medications more easily, but provides the opportunity to give IV fluids throughout the procedure. This helps the kidneys to metabolize the anesthetic more easily and to maintain hydration. During and after the procedure, we provide a complete pain control regimen to ensure comfort and swift healing. This helps to make sure that every pet awakens in comfort. Once your pet is home again, we follow-up with you by telephone to confirm that all is well. We are happy at any time to give you a tour of our surgical suite and to answer any questions that you might have. What must I do before my pet's surgery? It is important that surgery be done on an empty stomach to reduce the risk of vomiting during and after anesthesia. You will need to withhold food after 8:00 pm the evening prior to the surgical or dental procedure. Water can be left down for your pet until the morning of surgery. We will ask you to bring your pet into the clinic at 7:30 am the morning your pet is scheduled for the anesthetic. Should this be inconvenient, you may also admit him the night before at no additional charge. For many surgeries, we use absorbable sutures underneath the skin. These will dissolve on their own, and do not need to be removed later. Some surgeries, especially tumor removals, do require skin stitches. With either type of suture, you will need to monitor the incision for any signs of swelling or discharge. Most dogs and cats do not lick excessively or chew at the incision, but this is an occasional problem you will also need to watch for. We can always provide you with a soft collar to discourage this behavior. If there are skin sutures, these will usually be removed 10 to 14 days after surgery. You may also need to limit your pet's activity level for a time and to postpone any bathing or grooming for the first 10 days after surgery as well. Anything that causes pain in people can be expected to cause pain in animals. 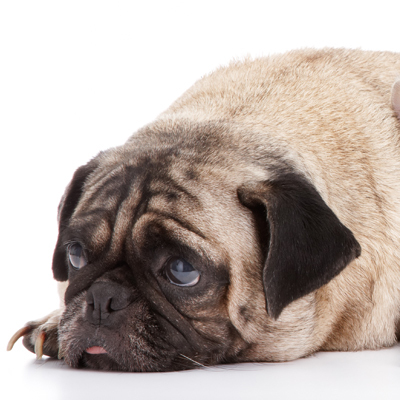 Pets may not show the same symptoms of pain as people do, but you can be sure they do feel it. Your pet's comfort is of the utmost importance to our team. The pain medications your pet might need will depend upon the type of surgery performed. Major procedures require more pain relief than things like minor lacerations. Injectable pain medications may be given prior to the end of the procedure so that he awakens comfortably. We also have excellent anti-inflamatory veterinary medications for both dogs and cats that can be given for several days after to lessen the risk of discomfort and swelling. When we follow up with you after the day of surgery, pain control is one of the things we will monitor and adjust if needed. While your pet is under anesthesia, it is the ideal time to perform other minor procedures, such as ear cleaning or implanting an identification microchip. The morning of the procedure, you will meet with your surgical technician for the day to review an estimate for the cost of the procedure and to fill out paperwork. This is the time to review additional options and make decisions accordingly. In addition, when you pick up your pet after surgery you can also plan to spend about 10 minutes to go over your pet's home care needs.